Answering the Hodgepodge questions yesterday got me thinking about family trips we took to visit grandparents when I was a young girl. My parents were both born and raised out west but thanks to the United States Marine Corps they ended up settling in New Jersey. fyi-it's a loooong way from Colorado and New Mexico to the Garden State. My parents had four kids and lived on a budget. 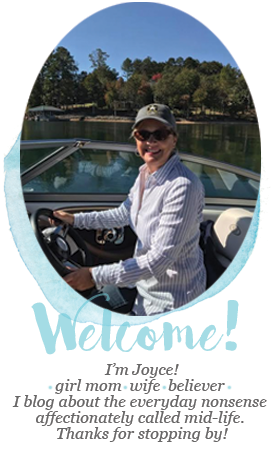 I feel like hubs and I are constantly booking flights, boarding flights, removing shoes, belts and jewlery for security, synchronizing calendars with daughter1 and daughter2 for their flights here-there-and-everywhere, driving to and from airports large and small, managing frequent flyer accounts, and zippng suitcases. Does reading that make you a little bit tired because living that makes me a little bit tired? Anyway, back in the 60's and 70's such was not the case. Flying anywhere was something of a luxury so we didn't visit my grandparents every year. Both sets typically made the trek to our house once a year or maybe even less often than that, but we only went out west as a family every few years. I remember it feeling like such a big trip and I guess it was. 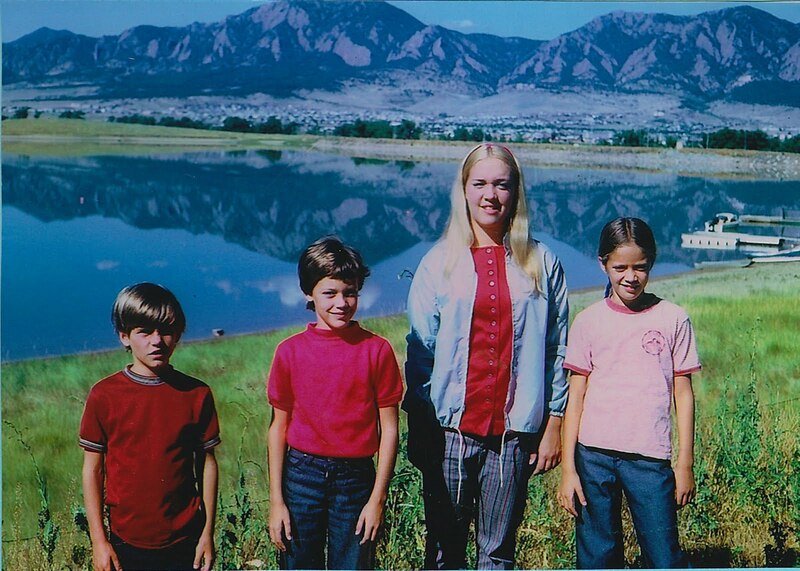 We would fly to Colorado and visit my dad's family and then after a week or so my grandparents would drive us over to New Mexico and we'd visit my mom's family for another week or so. I used to get so excited when it was time for the plane ride. Ha-I guess some things don't change. Back then we dressed up to fly and never considered wearing sweat pants and slip on shoes in case we had to exit via the emergency slide. We wore our church clothes and our best manners. My brother was usually the lucky one who got to sit next to the sister who puked. Too graphic? My brother would say not graphic enough. I remember taking Dramamine sometimes but I was also very well acquainted with the little paper bags in the seats. Mom-why did you ever let me fly without Dramamine? Big brother wants an answer to that question too! Amber waves of grain and purple mountain majesty. I believe the person who wrote America the Beautiful may very well have been standing on a dirt road at the edge of a Colorado farm. Even as a little girl the grandeur of the Rocky Mountains inspired awe. That backdrop doesn't even look real. I think this was a water tower of some sort, but I'm a city girl so I might have that wrong. Whatever it was it was just the right size for kids ages 9, 10, and 11. And that sky....the sky is bigger out west or at least it was when I was a child. At the end of the farm drive grew the worlds most perfect climbing tree, and my sister and I spent hours in its big branches. 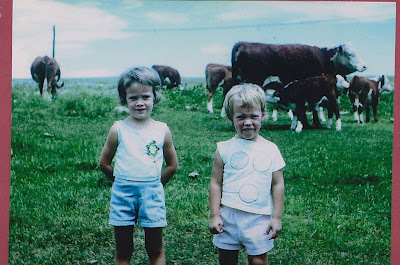 I loved the freedom I felt on the farm. We could wander around and explore and we especially loved prowling around the old barn. I have to laugh at some of the pictures I took back then. 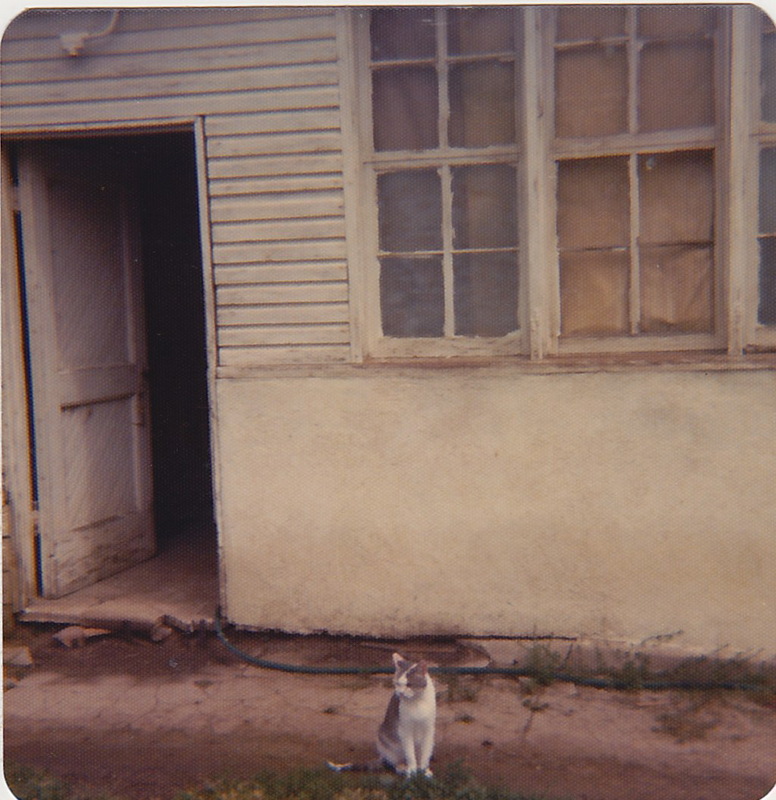 No picture of the barn but this cat sitting in front of the barn was special. She was well loved and had kittens every single year. Her name was Frisky. I didn't make the connection back then, but yes, I get it now. At one time there was a big swing that hung from the top of the inside of the barn. The swing allowed you to fly across the open space from one side of the barn to the other. I don't remember ever actually trying that but my older cousins did and it looked like scary fun. I suppose I was too young or possibly too chicken. That last one sounds about right. One of the things we looked forward to most when we'd visit our Colorado grandparents was a day up in the mountains. We'd head out early in the morning and once we'd climbed a bit we'd get out of the car and cook breakfast beside a stream. I kind of remember my dad and his brothers doing the cooking but my mom might correct me on that. My dad had three brothers and they all had a few kids so it was a great big mess of family. Perhaps it was the mountain air or maybe it was all those aunts and uncles and cousins and the chatter and laughter that made me feel all was right with the world. There is no better smell than bacon frying over a fire beside a Rocky Mountain stream in the cool crisp air. That coolness was a novelty too. We'd be dressed in shorts and loved going high enough into the Rockies to see snow in the middle of summer. That never happened in NJ! That's my brother in front and I'm the one with the pigtails. You'll notice I'm wading in the stream but manage to stick close to shore because at age nine I was nothing if not cautious. Hello Daughter1! My older sister is on the rock beside me and that's my grandma in the background. She raised four big strappin' boys on a farm and could wring a chickens neck. Not a lot of things in this life fazed her. 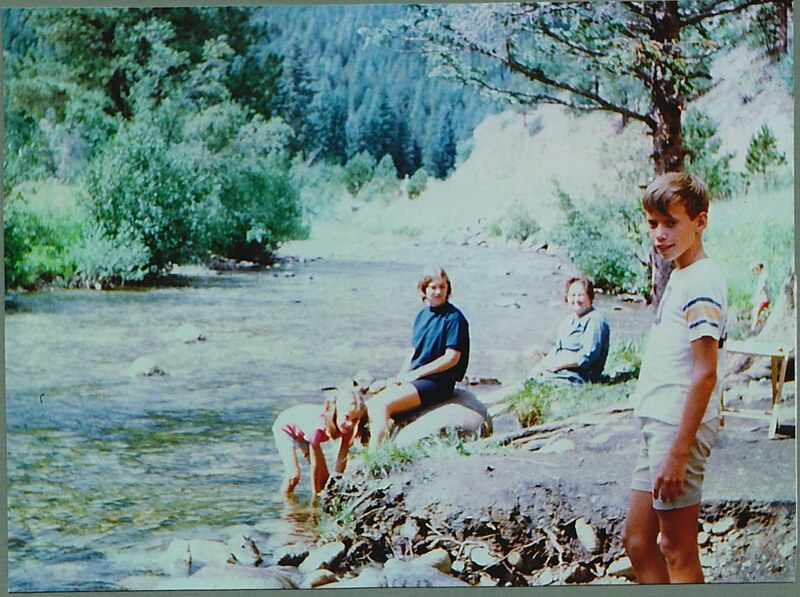 My younger sister isn't in this picture but if I had to hazard a guess I'd say she's out in the middle of the stream standing on a rock. She somehow always managed to get soaking wet on our treks into the mountains and I think I've mentioned here before that she was a little bit of trouble. Hello daughter2! Hello younger sister! 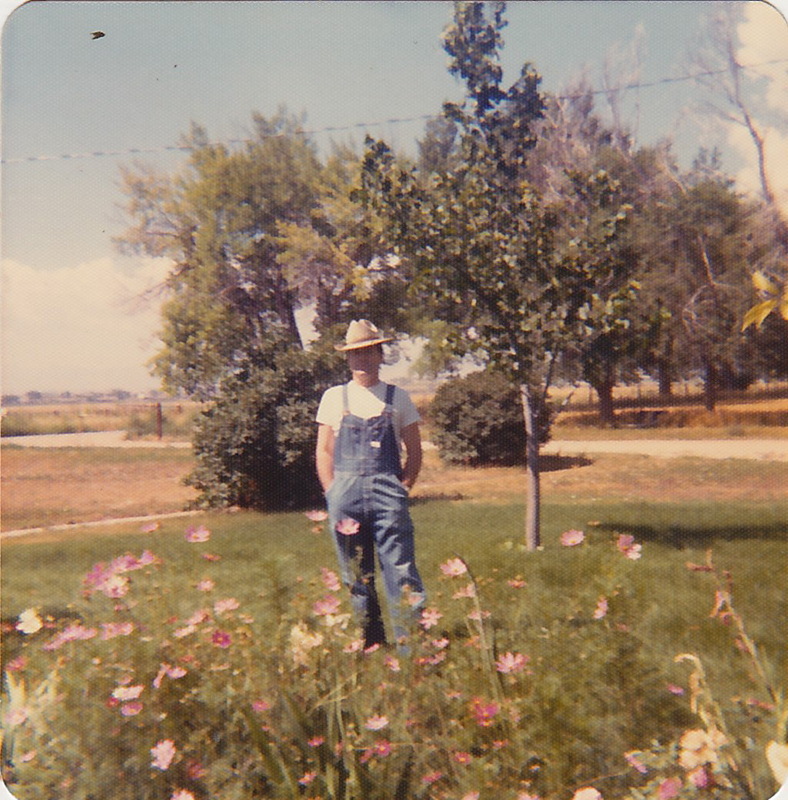 Here's a picture of my dad that I took on the farm in the summer of 1976. My dad was a Marine officer and later worked for a university so in his day to day life he wore uniforms and suits, starched and pressed. I think this was the real him. I wish now I'd asked him more questions about life on the farm. My dad wasn't a big talker so unless you asked he didn't really share. No blogging, no digital photography for most of his life, and I guess it didn't really occur to me to ask a lot of questions about his growing up years. Oh, we have plenty of stories that are told and retold because my dad was something of a rascal back in his youth, but what I want to know about now is the everyday life kinda stuff. One of the things I love about blogging is that stories are told. People often say their lives aren't interesting enough to write about, but the ordinary is what I enjoy reading most. I share a lot of memories on my own blog and hope one day my daughters and future grandchildren will look back and read them with a smile. And now here we are many paragraphs later and I haven't even gotten to New Mexico yet. The other side of the family will be in a post next week. I use too many words to be a legitimate blogger. Ask your mamas to explain why the cat was called Frisky. Enjoyed this walk down your memory lane! Very good post and really enjoyed the pictures, you can just feel the love in your writing and the pics. By the way I think that tank thing is probably for diesel gas for the tractor. Did he have a tractor? Thanks for sharing! Oh my goodness, Joyce - your memories totally took me back to moments that I had forgotten. It's so easy to get caught up in the busy-ness of life that we don't stop to simply reflect on the good stuff... thanks for writing this post. It made me smile in what has been admittedly a really rough day. You are such a blessing. Oh that's so wonderful. Those times were obviously very precious and more so now probably as you are looking back. What lovely memories you have. Colorado is my favorite place to be! We went a few years ago with Kevin's company. Perfect! thanks for sharing your memories with us. I love it! I often find myself not posting because I think well nothing really outstanding happened today & so what will I write about? Who will read this? Thanks for reminding me of why I started to blog :) For my family. We were in Estes Park a couple of years ago in June, and I was amazed ... we didn't have to drive very far up into the mountains to be in the middle of a Currier-and-Ives-esque snowfall. I'm definitely a beach kind of gal, but the mountains took my breath away. 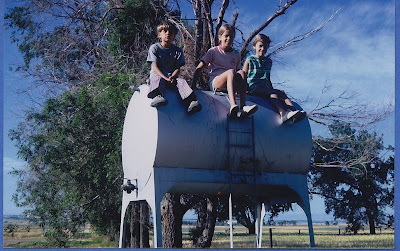 I remember a large propane tank that my grandparents had in their backyard ... my sister and I used to pretend that it was a circus elephant and ride it. I have to admit that I've gotten so used to reading so many blogs where everyday life is exciting and extraordinary ... my life pales in comparison and I've gotten to where I think that it's boring and not blog-worthy. Thanks for the reminder that I'm blogging for the same reasons ... so that some day my grands (and great grands?) can read them and remember Nana. I loved seeing your pictures....how great that you have these good memories. You are right that the skies are bigger in Colorado (though some are filled with lots of smoke right now). I am dying to go out West! I wish I could ask Poppie about life on the farm too. And I am so thankful you use too many words. love you. Joyce, I just love you, and your too many words! You are a gem, and your grandchildren will know it! Wonderful memories! 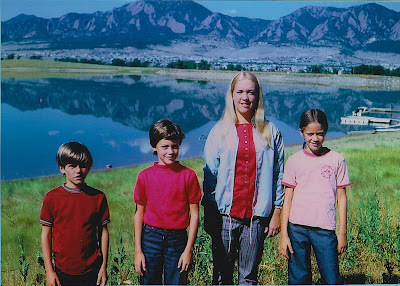 Living in Kansas, and now Nebraska, with a daughter in Albuquerque, we've spent a lot of time traveling through Colorado and New Mexico - not to mention wonderful childhood vacations to the mountains where it was cooler. It's so much fun to relive those trips - especially to talk about them with kids who can't comprehend things like traveling in the back of the station wagon (no seat belt laws) or no fast food places or drive through windows. Makes me feel old - but it was a wonderful time I would love to go back to. Sweet post Joyce. I love hearing about your childhood and it is the everyday stories that are fun to read. 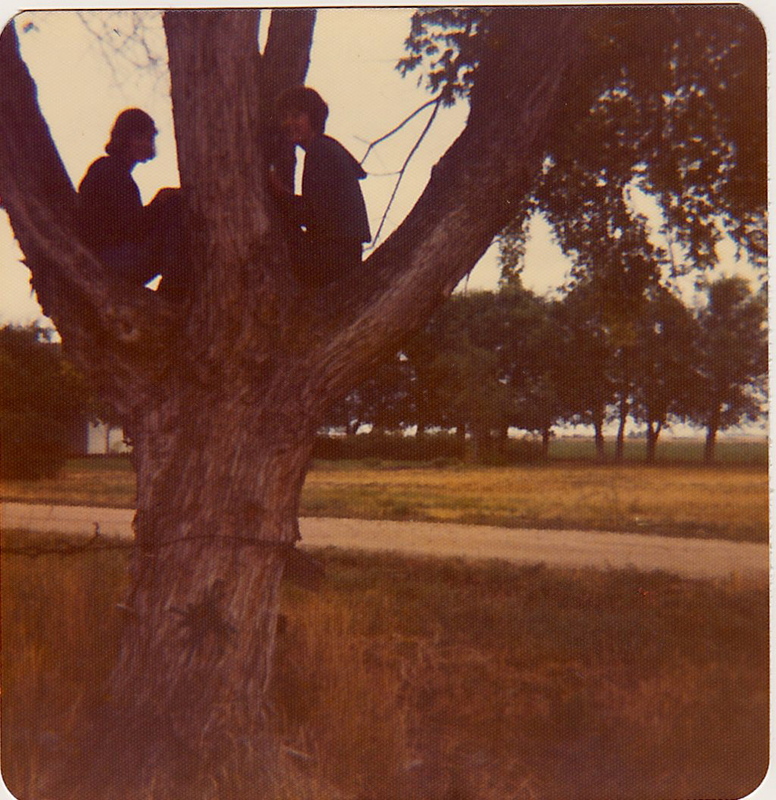 I need to scan some old pictures and do some everyday story telling too sometime. Great memories! Loved to travel out west-maybe one day I can. 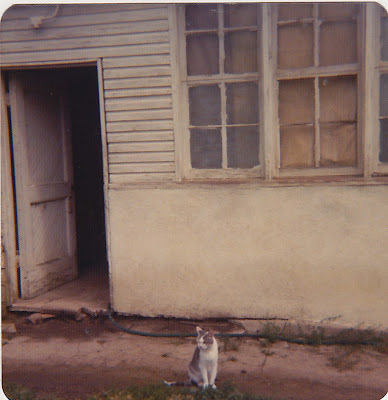 Beautiful memory-filled post with lovely photographs, enjoyed reading it. Now those are fun memories. I do love all the photos. Things were so different then and so true about dressing up for the airplane trip. I never flew as a child but we did take a trip across country from Illinois to California when I was about 8. My dad has all those photos. I have note all around my computer telling my children don't ever turn off my blog!!! These are the stories your grandchildren need to read. What a wonderful collection of memories! what a really nice post--i loved hearing about your childhood! You need to come West again! Also, it is my opinion that you always use just the right amount of words! Such fun memories! We're in Colorado this week, so it's fun to see your pictures from your childhood. Isn't it fun to look through old pictures and remember? I recall a comment my friend who just passed away said about nostalgia. She said she read an article in Guideposts which says that nostalgia is good for us. It says it helps us to stay true to ourselves despite huge life changes; it gives us perspective; it boosts our memory - according to clinical studies! So there ya go! The Frisky kitty made me giggle! I've been to many states, but I've managed to miss out Colorado. It looks spectacular. I use way more words than you do... What does that say about my blogging? I love the Rocky Mtns... We lived in Montana for 10 years and I loved every minute of it. In fact, I love the "big sky" out there so much I feel like Western Montana is the spot on this earth where I belong... Where my heart sings. Now I just sound crazy too... Yep, that's me... The crazy, too many word using blogger! What a wonderful, nostalgic post! 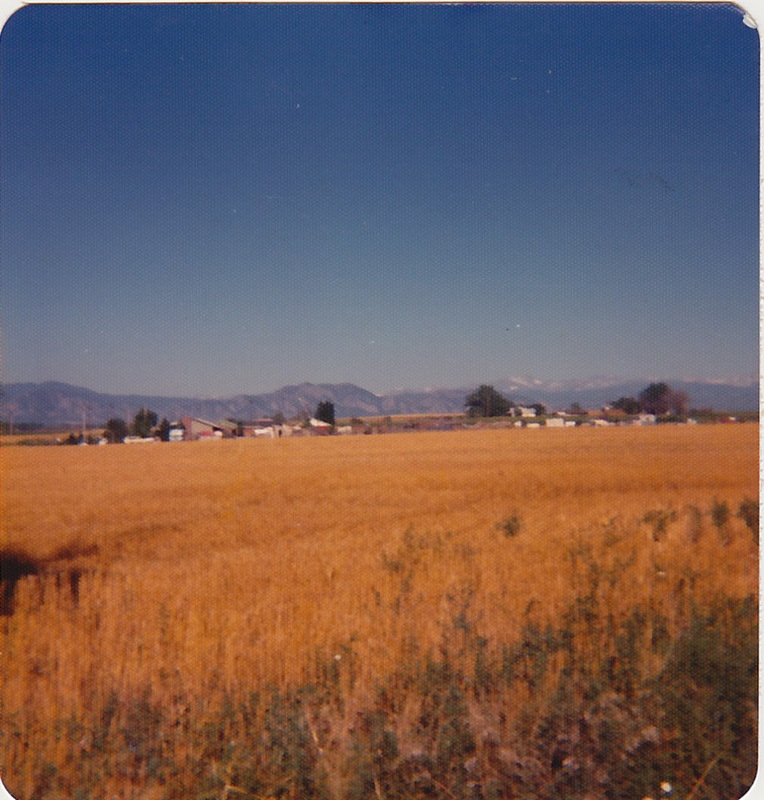 How different life is now from the Colorado farm your dad grew up on, huh. 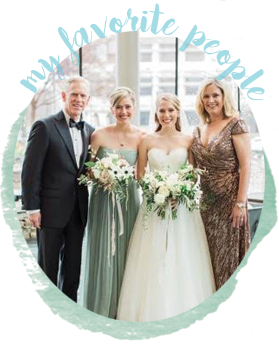 So nice you have those great memories - and that you're writing them down so that your children and [future] grandchildren can get those glimpses of their grandpa. I find it so amazing that we are able to share and record our thoughts and memories for future generations. It was the reason I began blogging in the first place.